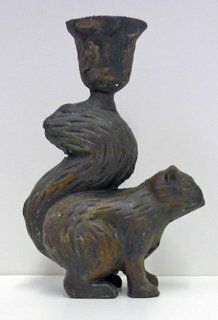 The Cast Iron Squirrel Candleholder is another one of our cute solid iron animal candlesticks! Just like our bunny, this little squirrel will hold a taper candle and is available in brown. 6" high. Both can be used indoors or outdoors. If you have any questions about this product by Trade Routes NW, contact us by completing and submitting the form below. If you are looking for a specif part number, please include it with your message. Melrose Pack of 2 Antique-Style Bronze Birds and Owls Pillar Basket Candle Holders 12"